My healthy living lifestyle hasn’t always been an easy road. I used to prefer processed foods that didn’t require anything other than a microwave in order to eat. I didn’t cook, I didn’t want to spend much time in the kitchen and I liked junk food. Making the transition to healthier living was a hard one. The first big change I made was switching my regular soda to diet soda. It was disgusting. I hated it. It tasted weird, it tasted like chemicals, I had to choke it down. But after a few weeks, I got used to that and didn’t mind it so much. After I got used to drinking diet, regular soda tasted strange! Eventually I made the switch to sparkling water because I didn’t like how the diet soda made me feel. I had to retrain my taste buds, too. There were a lot of healthy foods I didn’t really like because I never ate them. I learned to like some things and eventually learned to love and prefer the healthier options. Cottage Cheese – I hated this for years! It was so gross. I hated the flavor, or lack of, and the texture. Eventually I started liking it because I mixed it into salads and dinners. Now I can eat it plain. Cottage cheese is a great low calorie snack option because the high protein fills you up. Cooked Spinach – As a kid I refused to eat spinach. My mom would try to make me and I’d gag and spit it out. That followed me into my adulthood and I avoided all spinach. What made me change my mind was meeting Michael. He made me a spinach salad and I really liked it. Then he made me a scrambled egg dish with feta and spinach and I shockingly enjoyed that too! Plain Greek Yogurt – Yogurt for me was that super sugary crap like Yoplait. Sugar, sweet, fruit, it was more like a dessert than a healthy snack! I slowly made the change to Greek yogurt and liked the texture a lot. Chobani was my favorite and I stuck to the fruit flavors I liked. Eventually I switched to plain and added my own fresh fruit. My palate definitely changed and I prefer that now. Onions – How I learned to like onions was French Onion soup. Who doesn’t like caramelized onions?!? Now I can eat onions in salads raw, cooked, anything. Squash – I hated all kinds of squash as a kid. It was both the flavor and the texture. I learned to like it when my friend Star baked some acorn squash with brown sugar. It was like a dessert! Yum! Then I tried spaghetti squash as a substitute for pasta noodles. Loved it! And it’s so low in calories. 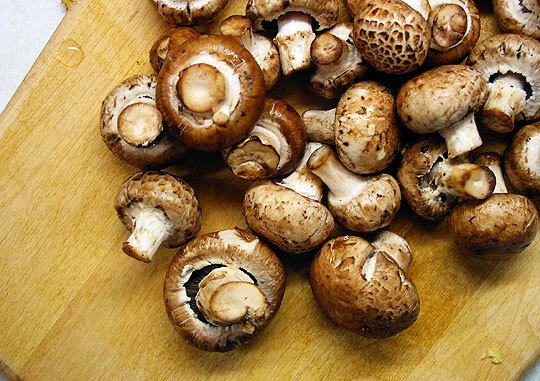 Mushrooms – Yuck, yuck, yuck. Hate mushrooms and always will. The flavor, the texture, the smell, everything. I can’t even eat food that has mushrooms in it. Green Tea – I still don’t like the flavor. It’s bitter, I just can’t take it. I know it’s good for me, so I take green tea supplements instead. 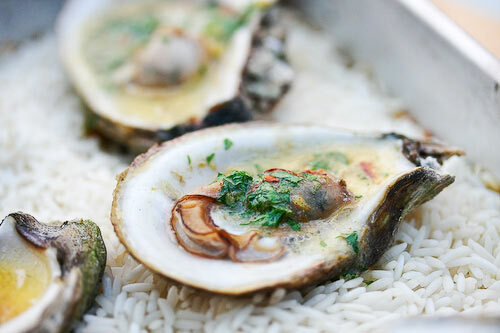 Oysters – I know these are healthy and popular but I just can’t do it. The texture and size of oysters just gross me out. I’d rather eat clams or mussels! Mango – I love all fruit but for some reason mangoes are not one of them. Papayas are kind of up there too. I don’t understand the whole “oats in a jar” phenomenon in the blog world. Seriously, someone explain it to me. What’s wrong with a bowl? I miss running races, I miss the camaraderie. That’s all. Sometimes I get burned out with working out 5 days a week and wish I had the strength to take an entire week off and not worry the whole time that I will gain weight or fall off the exercise wagon. I think what I miss most from my “previous life” was not having the awareness of calorie counts. Sometimes I just want to drink a 600 calorie strawberry daiquiri with whipped cream and eat half a pizza but knowing how many calories that would be turns me off from the idea. QUESTION: Do you have any healthy living confessions you want to share? Any healthy foods you just can’t make yourself like? Oh, man. Do I need to try cottage cheese and greek yogurt again? I have avoided cottage cheese/cream cheese/sour cream my entire life…I’m proud of you for being open to new things. Kiki recently posted..Fat-Lapse. Major Fat-Lapse. I adore your honesty!!! This is so great! When I lost weight I learned to really love veggies! I also started disliking mayo. Now I can’t stomache it! Spa love!! Thank you, Jenna. You know what’s funny, I hated mayo for most of my life (I always ate the weird diet stuff) and recently switched to real mayo and actually like it a lot now. I think eating a little bit of something real is better than eating a lot of something fake. Or at least, my body thinks so. I feel so much better. Yes, True Confessions was a “tabloid” magazine before there was such a thing a bajillion years ago. That’s the kind of crap I know because I’m old. Green tea makes my stomach jumpy, and I’m never eating oysters EVER, even if I’m on Survivor. Thanks for clearing up the mystery! I know! I wish that resort/spa wasn’t so un-affordable. It sounds like paradise. I give up on the cottage cheese. I tried and tried and tried. No dice. Spinach almost everyday, though. Now what the hell is “oats in a jar”? I have no idea about this weirdness. I understand that. There are still some things I just can’t do. I don’t like kale or green smoothies. I know I “should” but I just can’t do it! Diane, fit to the finish recently posted..Have You Ever Heard of the Global Fat Scale? Have you tried kale chips? I made those all summer long and loved them! I was doing green smoothies for a long time and what helped me was using a lot of fruit in it. Bananas, frozen strawberries, some yogurt. Made it less bitter. I can’t eat oatmeal any longer. The texture was always an issue and I didn’t eat it too often, but after my last pregnancy the thought of it grosses me out. The oats in a jar thing doesn’t make since to me either, but salad in a jar doesn’t make since either. I did discover as an adult that I love asparagus and have developed a toleration for peas. I will not eat a serving of peas, but don’t pick them out of things and I actually like them in cold salads. I tried collard greens, parsnips and turnips recently and have determined that I definitely don’t like them. After recently buying store brand yogurt my son complained that it was sour. When I tried it I realized it probably was sour to him, because I normally buy Yoplait! The yogurt just tasted more like plain yogurt than he’s used to. I realized how much sugary artificial sweetners I’m getting in yogurt, so I should probably by more store brand “sour” yogurt. 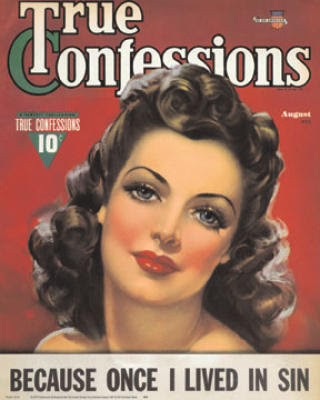 True Confessions was an enormously popular magazine in the 40’s! Michael can’t eat oatmeal because of a texture thing too. For me, I try to get that Scottish Oats type where they are chunkier and chewier than the creamy oatmeal. I learned to love asparagus as an adult too. It’s one of my favorites. When I started to make the transition from sugary Greek yogurt to plain, I thought it was really sour too. I added some fruit or agave syrup to it to make it palatable and now I can eat it plain with no issue. Michelle @ Eat Move Balance recently posted..Apple Picking Success! It’s nice to hear I’m not the only one with those feelings! Trus Confessions *was* a magazine way back when. I grew up in a family that rotated about five dinners week after week. Crumbled hamburger and corn, mac n cheese (with nasty Velveeta), spaghetti, beans and ham, and hamburgers. The rest of the food in the house was all pre-made stick it in the microwave stuff or out of cans. I can’t remember every having fresh veggies in the house until I started buying them for myself around age 25. My idea of heaven was an actual home cooked meal- didn’t matter what it was when 90% of our food was microwave ready. My favorites snacks as a kid were entire cans of spinach or green beans or asparagus.I could not get enough of them. I was about 30 before I ever ate asparagus not out of a can. Almost any food except what I listed above my mother considers to be “exotic and nasty” and she wouldn’t allow it in to the house. Now since I buy all my own food and we occasionally go out to eat, I’m game to try just about anything. I love salads and steaks and veggies of all sorts. Oddly enough, there is very few fruits I like. I’m still working on that as the ones I do like tend to be the fatty high carb ones, with the exception of canteloupe and honeydew. I can see why growing up in a house like that you’d want a home-cooked meal. I think it’s great that you are trying to change that now as an adult. That’s too bad your mom doesn’t want to try healthy foods! Love this post! A food (or really a food group) that I don’t like but would love to is seafood. It’s so healthy for you but I just cannot make myself like it. That’s a shame! But not uncommon. I know so many people that dislike seafood, or specifically salmon. But if you don’t like it, you don’t like it. i used to hate brussels sprouts too, I thought they had such a terrible aftertaste. But I read somewhere that blaching/roasting takes that taste away. Plus anything is good roasted in salt and oil. I tried OIAJ once. It was like eating cold puke. 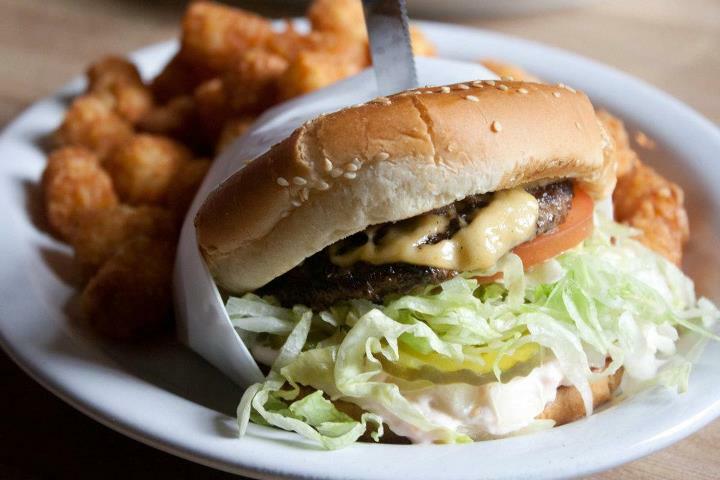 Marie recently posted..Burger World + A Very Special Anniversary Edition! I wasn’t a huge fan of roasting them. But maybe it was because I scorched them a bit? I prefer them sauteed. Of course in bacon fat. all of your healthy foods that you have learned to like are the same as mine! I used to hate all yogurts now I can’t go a day without greek yogurt! Isn’t it funny how our habits and palates change? I don’t get the oats in a jar thing either. Jars are so difficult to eat out of and annoying to clean. Bowls, people, bowls. Also, cold oats? Ew. Oatmeal is meant to be eaten warm. I’M IN! Lets escape to the resort!!!!!!!!! I started eating Greek Yogurt after not eating yogurt for over 20 years. I had to get over the texture, but once I did that I was golden. Can’t eat: Mushrooms, bell peppers, milk (well, thats a drink), pumpkin (but we eat it as a savory food here). I can’t do oatmeal, it looks like someone has already eaten it. I confess that I love working out now. If I don’t workout I feel like I haven’t completed my day! It didn’t take me long to get over the texture. It was definitely thicker than the yoplait I was used to. But once I did, I loved it! Now I can’t eat anything besides Greek. I love working out too! I miss it when I don’t. Just found your blog, can’t wait to look around! I make my brussels with bacon and caramelized onions or roasted garlic. I think adding those thing to anything would make it taste better! I’m with ya on the mushrooms too…gah-ross! Thanks for checking out my blog. 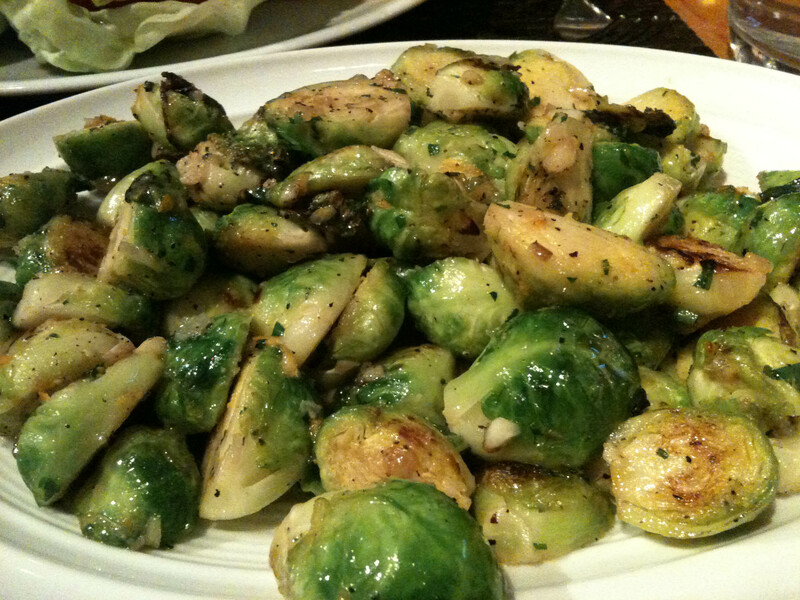 I agree, brussels sprouts with bacon, onions or garlic are fantastic. I use Grape Seed oil to sautee it and it’s delicious. I used to worry about taking some time off exercise, but I feel super charged right now because I’ve been more relaxed with myself–and I’ve lost a few pounds over the last month while letting myself be a little more relaxed! I love cottage cheese though, always have. It’s not a healthy food for me because I eat too much of it! I think it’s natural to worry about falling off the wagon with a break. I also think it’s healthy (usually) because it reminds us NOT to let ourselves fall off the wagon. How do you eat your cottage cheese? I love putting it in salads or having it as a side with dinner. I don’t like green tea either, but I love oolong. It’s a red tea that’s fermented more than green and less than black tea and has a lot of antioxidants. I use it to make iced tea. You should give it a try if you haven’t already. I do have some oolong. Never tried it as iced tea. I will give it a go.